Food might not be the first thing you think of while planning your trip to Germany, but it has just as much of a food culture as anywhere in Europe. The cuisine is tasty, unique and varies from one region to another. Each region has its own version of certain staples, and some dishes are unique to one area. 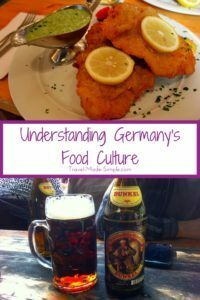 This should help you understand a little more about eating in Germany and bit about the food culture. So the real food of Germany is bread. Bakeries are more common than just about anything else. They are often allowed open on Sundays when the rest of the stores are closed. They will have a dazzling array of bread in all manner of shapes, sizes, flavors and grains. Pastries as well are in abundance. This is wonderful to remember as a traveler when the hotels want to charge you 7 euros for breakfast. Say no and hunt out a chocolate croissant or nut swirl. Every German train station of any size will have a bakery as well for your pre-train breakfast. Beyond the simple loafs of bread, the most common object in a bakery is the Brötchen. 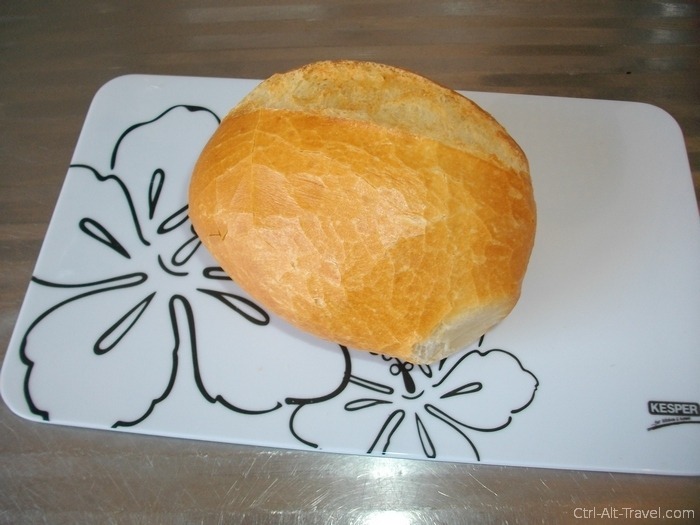 Brötchen is a generic term for a roll, literally “small bread”. The “common” Brötchen is a bread roll about the size of a fist with a fairly crusty outside and soft white inside. As with everything in Germany, there are regional variations, but the standard breadroll of some sort is universal. Bakeries will usually have sandwiches called “Belegte Brötchen,” but even then expect only a single slice of salami or cheese and probably butter. The bread is the thing with the rest as an accent. So where do Pretzels come in, you might ask. The “oh so German” bread is really just native to the southern German provinces. In Munich you can see them the size of a basketball hoop being carried by women like a purse, but the “standard” pretzel or (Bretzeln) is about the size of your hand. They have spread across Germany, so it is not unusual to find them in the north as well, but the south will have the most variety. 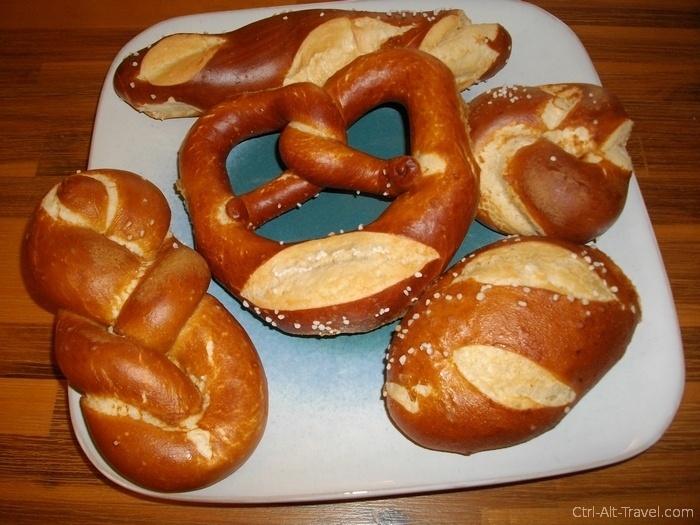 The pretzel is actually the shape, while the bread is called Laugen and comes in a bunch of shapes, and it is common in both Baden and Bavaria to find Butter Pretzels with the pretzel cut open and layered with butter. Almost everything begins with bread in Germany, but there are a lot of wonderful things to put on it. 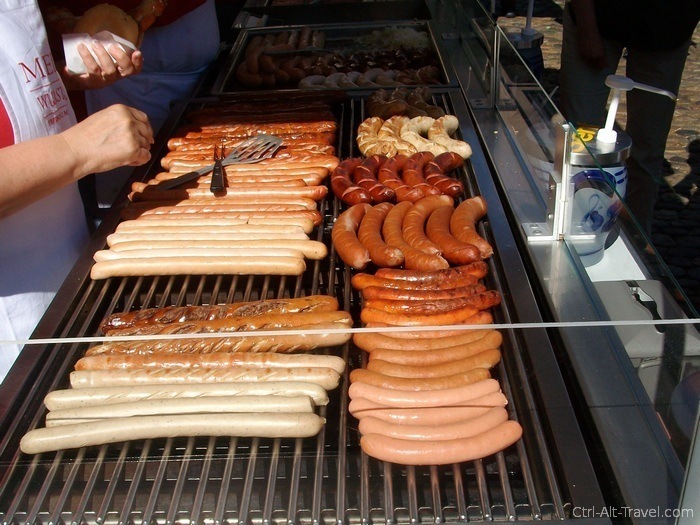 Sausage is definitely well associated with Germany and for good reason. Each region, and even each city, will have a particular type of Wurst that is “theirs” though the regional variations can be found all over. Head to the farmer’s market for a sausage on a Brötchen for a couple of euros. Sausage appears in several other forms in Germany. Salami, which is really a big dried sausage thinly sliced, is very common, especially on pizza and on Brötchen. Currywurst is another favorite. This is a sausage cut into bits and drenched in curry ketchup. You get a little fork to eat it with. It is usually quite mild, but can be spicy depending on the place. This is not like an Indian or Thai curry, it is something else entirely. 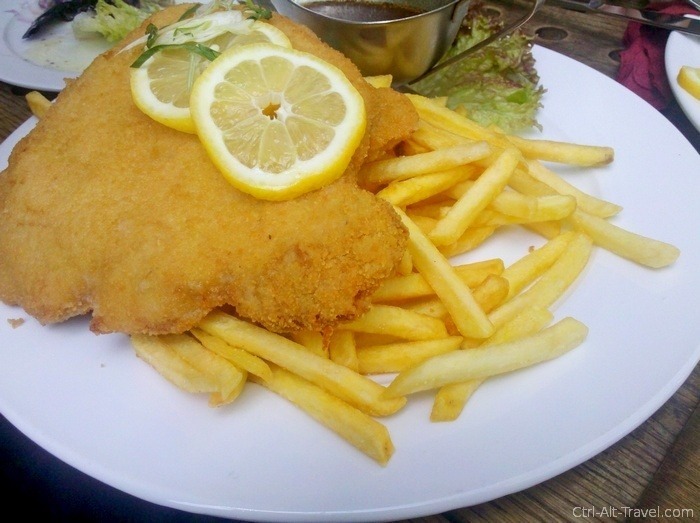 Going into a restaurant, Schnitzel is probably the most common meat in Germany. 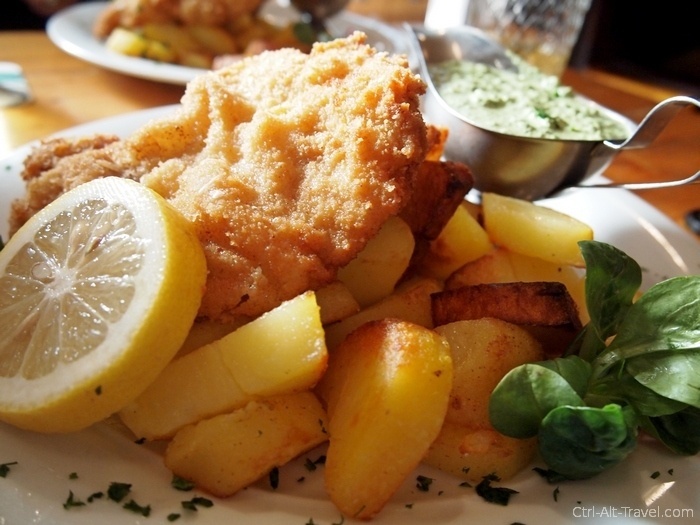 Schnitzel literally means “cutlet” and will be a piece of meat pounded thin, breaded and pan fried. It’s usually pork, sometimes turkey, and the closer to Vienna you get the more likely it is veal. Try to eye out the other people in the place who have ordered it. You might consider sharing if you aren’t starving as Schnitzels can be enormous. Beyond the basic meat on a plate, there will almost always be some form of potatoes next to it. As for sauces, it really depends. This can range from a simple lemon wedge to a mushroom cream sauce (making the dish a Jaegerschnitzel) and beyond depending on the region. Pommes (pronounced Pom-ess) is the German word for fries. The meat and potatoes cultural expectation is beginning to round out, you see? There is nothing particularly special about fries in Germany compared to anywhere else you might have traveled (except for Belgium, but that is another post). You will likely get asked if you mayo or ketchup with them though. A common German breakfast involves a Brötchen cut open and spread with whatever. This “whatever” ranges from Nutella to honey, jam and butter on the sweet side to sliced salami and cheese on the savory side. Pretty much everything in between is possible as well. They even have spreadable sausage paste. Soft-boiled eggs are common as well, so the yolks will most likely still be runny. Coffee and tea are common to drink. Germans have a cultural affinity to coffee. It is available in every bakery and at every restaurant. If you like the stuff, you will find it aplenty here. All of the variations like Cappuccino, Cafe Latte and such exist in many places as well. And don’t picture a glass coffee pot with plastic orange handle, even the corner bakery is likely to have a big shiny whirring machine to produce freshly ground coffee by the cup. The water in Germany is perfectly drinkable and clean from the tap. And yet it is nearly universally avoided by the population. Fizzy water is the “standard” water in Germany. If you order it at a restaurant, be prepared to ask for “Still” if you don’t want bubbles. This fizzy water is so common in fact, that they mix it will other things to make new drinks. The term for that is Schorle. The most common Schorle of them all is the Apfel Schorle, or fizzy apple juice. You will find this on any menu and there are even bottled versions in the grocery store. Wine-schorle exists and so does Beer Schorle, though that is usually called a Radler. So we come to that most quintessential German drink, beer. Beer is both ubiquitous and cheap in Germany. A half liter mug in a restaurant should be 3-4 euros, with half-liter bottles in the grocery store running about a euro (with deposit). Beer is also quite regional. Certain brands are available everywhere, but each town will have one or two “local” breweries that will supply just that region. If beer really truly isn’t your thing, Germany is also home to plenty of good wines. The two most common types of beer are the Pils and the Hefeweizen. Pils are lighter in color and often slightly more bitter. These are the traditional style of beer made of Barley, Hops, Yeast and Water as per the Rheinheitsgebot. This is what you will get if you just order “bier.” Hefeweizen are wheat beers. They are cloudy and sweeter than the pils. A weizen is served in a tall curvy glass. 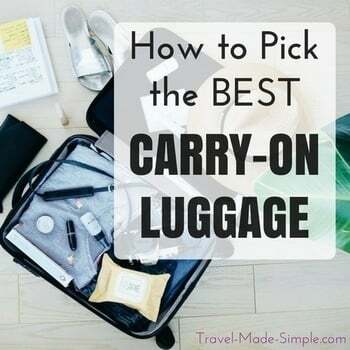 Beyond these two classifications there is a world of variations. There are darker beers and smoother beers. You need to experiment and try a few to find what you like. Though most people don’t go to Germany for the food, there are delicious dishes to be eaten here. Before you order at a restaurant, ask what’s local so you can try the regional dishes. 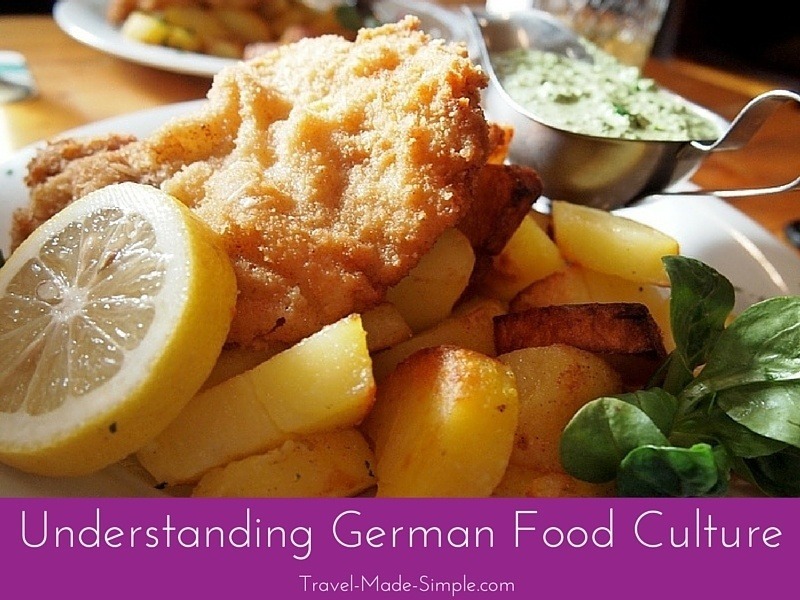 Knowing these things about eating in Germany will go a long way in helping you to explore Germany’s food culture and enjoy your visit to this country. Looks like I’ll be constantly hungry during my time in Germany … can’t wait! Ah yes, I do miss German food. The bread is always the thing my wife and I talk about the most. I thought maybe it was just us, but every time we host a German exchange student, the one thing they miss the most is the bread! In Germany, the bakeries are quite ubiquitous. 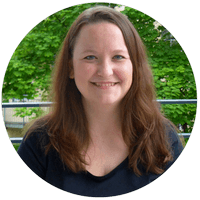 One of our students, growing up near Munich, had a bakery in the same building as her flat. She told us she used to simply walk downstairs in her pajamas every morning to get breakfast! The bread seems to be the biggest thing I hear about that Germans miss when they’re somewhere else. The choices of bread in every bakery can almost be overwhelming, and the fact that there are usually multiple bakeries on every corner speaks volumes about the importance of bread in German culture. I think if I lived above a bakery here, I’d gain a ton of weight because I’d end up eating chocolate croissants every day! The bread in Germany is fantastic. So many different varieties beyond white bread. I love the dense bread with sunflower seeds in it. And Holzofenbrot has such a great texture. Crispy on the outside, soft on the inside. You could do an entire blog post just on breads. Our baker sells 44 different kinds. “Fizzy water” is usually mineral water. I tend to buy the medium (not super bubbly but not “still”). Radler is made not with normal mineral water but with lemon-flavored fizzy water. I was leery of it but tasted it. It’s so much better than I expected. However, I am not the beer drinker. Luckily, as you noted, Germany has much to offer in the way of wine. I am not a big fan of sausages (though have had currywurst) but my favorite is Weißwurst with Süßersenf. Have you tried? My favorite German food? Zwiebelkuchen. Thanks Linda! I actually prefer the red sausages to the white ones, though I have no idea which specific ones! And yes, Germany has amazing bread. I’m not sure why the country isn’t more well known for its bread.